Islay Festival 2010 is looming and it is now known what limited goodies two Diageo-owned Islay distilleries have in store for thirsty visitors. From Lagavulin there is a single European oak cask filled in August 1994, bottled at 52.7% ABV. The release consists of 528 smile-inducing units of happy-happy-joy-joy. The cask was picked by Iain McArthur from the famous Port Ellen warehouse. 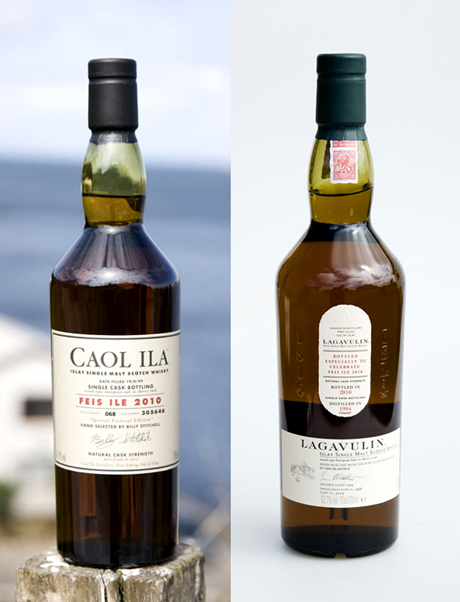 The cost is £74.99 and bottles will go on sale at Lagavulin on Saturday 22 May – Laga’s open day. From Caol Ila there is an ex-sherry European oak cask filled in August 1999, bottled at 61.9% ABV, consisting of 558 bottles. The cask was chosen by Billy Stitchell, long-standing Caol Ila manager. A bottle will also cost £74.99 but will go on sale on Monday 24 May. Both releases will be sold on a first-come, first-served basis and will be limited to one bottle per visitor. This entry was posted	on Monday, May 17th, 2010 at 10:02 am	and is filed under News. You can follow any responses to this entry through the RSS 2.0 feed. Responses are currently closed, but you can trackback from your own site.